The Eau Claire School of Dance is proud to offer superior dance instruction to children and adults in the Chippewa Valley! Our kind, knowledgable, passionate staff is excited to bring joy to our dancers in our 21st season of fun, fitness, and of course, DANCE! Enroll your child today! You'll love our dance family! Looking for our Summer Program? Click Here! Age 18 mos. - 2 yrs. 18 mos. - 2 yrs Mommy & Me! Check out our Performance Teams, too! See our Company Brochure or CLICK HERE to learn more! Dancers must audition for ECSOD Company. Please email us if interested! Did you dance competitively throughout High School? Are you over 18 but don't want to stop dancing? Join our Competitive College-Age Dance Team! Advanced dancers and 18+ work together to improve skills and overall technique, precision, and teamwork, while learning and perfecting 2 competitive routines: Contemporary Jazz/Lyrical and Hip Hop! Online Registration is NOW OPEN!! Click HERE to Register Online! Please note: A $30 Non-Refundable Membership Fee will be charged when Registration in processed. Thank you! 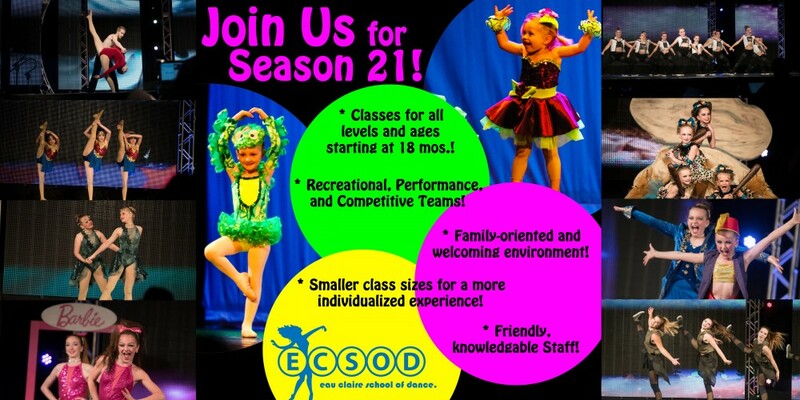 If you do not see a class or time that you would like, please email us at info@eauclaireschoolofdance.com. We will do our best to accommodate your requests. Thank you! !